Klara Budilovskaya was the Kilroy of immediate post-Communist Ukraine. Her name appeared on street corners everywhere, along with lists of the services she supposedly rendered—but only to foreigners. It was a peculiarly insecure way to express newfound freedoms. Such cultural history remains fresh in the consciousness of many Ukrainian painters, poets, and musicians who make up the city’s artist colony. 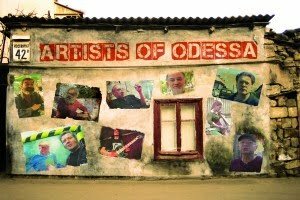 Dmitryi Khavin takes viewers on a tour of their neighborhood in his documentary Artists of Odessa (clip here), which has its American premiere this Sunday at the JCC in Manhattan. Khavin introduces us to the Ukrainian equivalent of the Village, the historic Moldavanka district, traditionally the home of the city’s working class. Now largely de-industrialized, it is exactly the type of neighborhood that attracts the artistic and the funky. Living communally in a building that reportedly once hosted Chekhov, an older artist analyzes the layers of graffiti art on his walls like the rings of a tree. He might have to move soon, which could either be good or bad. Indeed, ambiguity seems to be a way of life for Odessa’s artists. Many artists still seem to be processing the fall of Communism and the aftermath of the Orange Revolution. According to a colleague, artist Leonid Voitsekhov saw his share of prison cells during the Brezhnevian 1980’s for the private exhibitions he held in his flat of his sexually themed paintings. Yet, we also see hipster second-hand store owners haggling with customers over Communist-era collectibles. While it is always perilous to make sweeping generalizations about styles and periods of art, there does seem to be a pronounced tendency among the poets towards absurdist humor. There is also a significant current of irony running through the work of Odessa’s painters, but one can also see the influence of classic Russian icons amongst the work Khavin documents. Unfortunately, the musicians heard in performance do not leave much of an impression, generally coming out of singer-songwriter or grunge-rock bags (no jazz, alas). Though a relatively short doc at fifty-five minutes, Artists provides quite a few telling moments and liberal portions of local color. Produced with the support of CEC Artslink, it will definitely give those fascinated by the former Soviet sphere of influence a good quick fix. It screens this Sunday (1/9) at the Upper Westside JCC, followed by a special Q&A session with Khavin. Ferrara at AFA: Mulberry St.